Scary, scary monsters, now available! 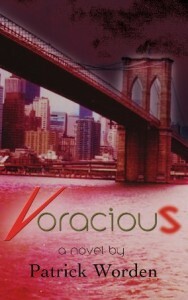 Now available through Booklocker.com: Voracious by yours truly (distribution will be picked up within mere days by Amazon, Barnes&Noble and all your favorite book-hawkers; ebook version dropping within a week). Be sure to check out TheyAreVoracious.com for teasers, excerpts and news. Drop back by often, as new content is added frequently. And stay tuned for your chance to win an autographed copy (first edition) of Voracious plus more bonus swag! This entry was posted in New Post and tagged best selling books, books, Carl Hose, e readers, e readers e readers, horror, horror novel, horror novel publishers, novel, novels, patrick worden, read books online, vampire fangs, vampire fiction, vampire novel, vampire teeth, Voracious. Bookmark the permalink.